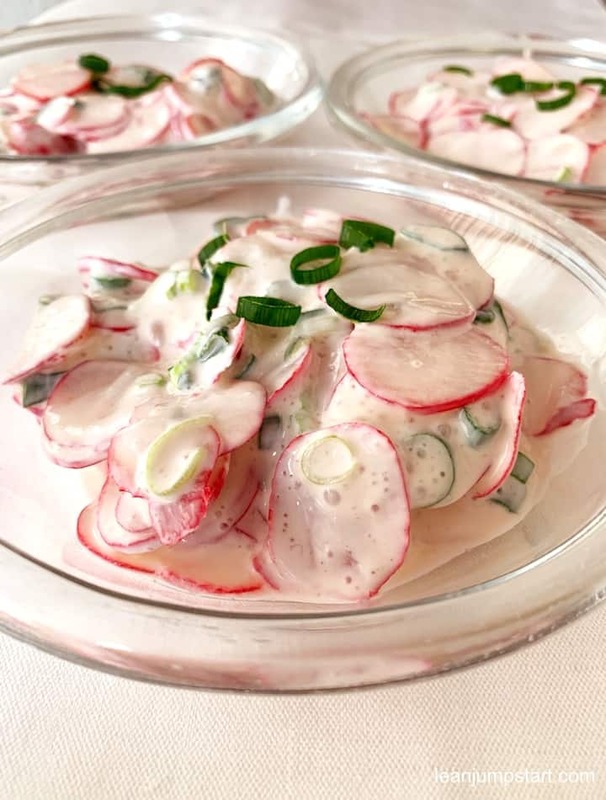 Here comes my absolute favorite radish salad. Maybe until now you didn’t try any radish salad recipes because you found the taste of this pink root vegetable just too pungent. 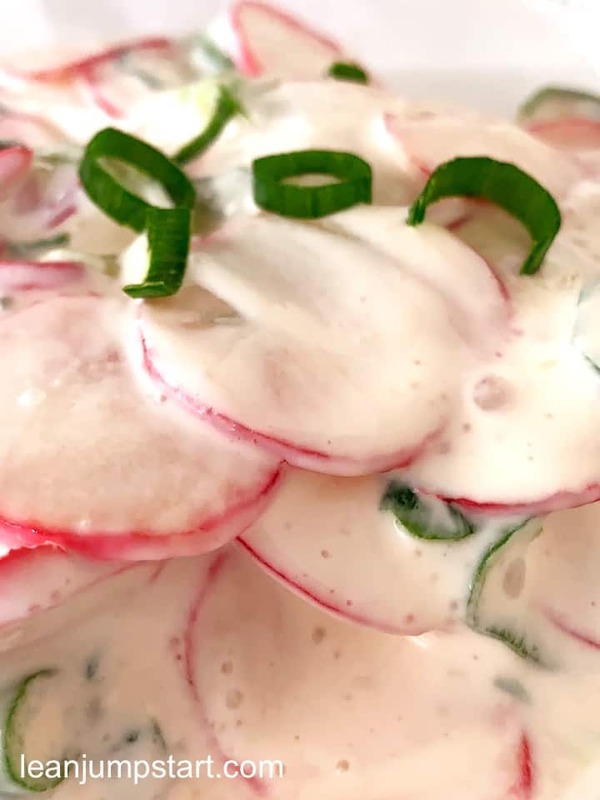 But hold on a minute, I think my ultimate creamy salad recipe will blow you away:) Let’s start with some radish facts. This vegetable belongs to the family of Brassica, the same family my beloved cabbage is belonging to. So it might not surprise you that among others this vitamin powerhouse comes also up with weight loss properties. 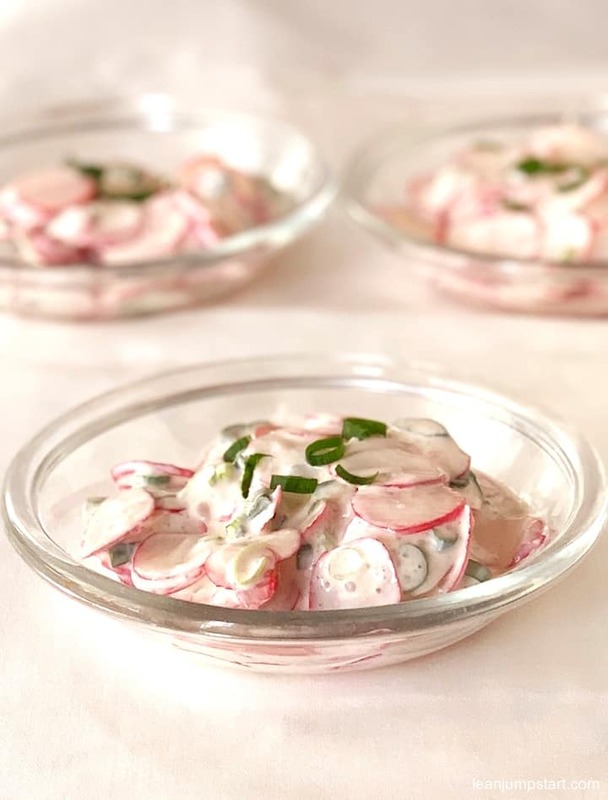 As I know how much my readers value when I share nutrition tips and specific benefits of whole foods, I have added a section about radish health benefits below. But I digress – back to the recipe! While I prefer for most of my clean eating salads a vinegar/olive oil dressing and sometimes play with lemon juice this doesn’t work for me with radishes. To balance out its peppery taste I combine the salad with sour cream and green onions – a perfect match made in heaven. For variation, I sometimes use chives instead of green onions. You could also use heavy cream but for me, it turned out great with sour cream and you save more than 50% in fat calories. To reduce even more on fat you could choose a light sour cream. Generally, light reduced-fat (sour) cream versions are processed and not the clean eaters best friends, so you have to make a decision. Also, if you want a vegan version you could use soy cream instead of sour cream. 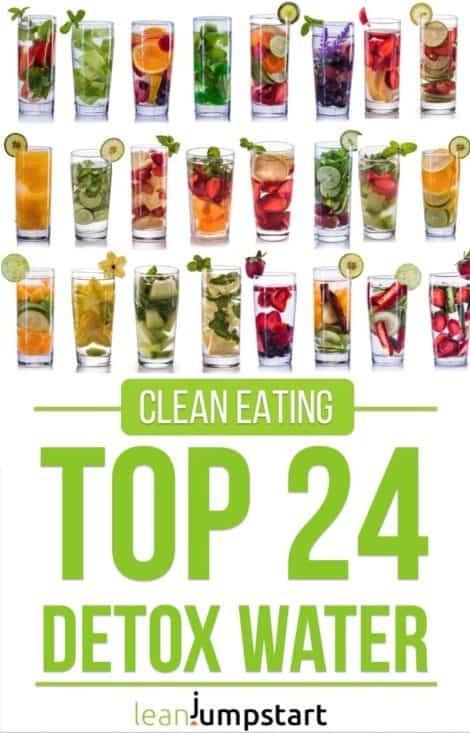 As you might know, I’m not a radical clean eater but prefer the clean eating 80/20 approach giving me more flexibility regarding food choices. You can bet that in times when my favorite jeans feel too tight, I’d rather use the light sour cream version. In a small bowl, toss to combine sour cream, vinegar, and chives. In a large bowl toss gently vegetables with the vinegar-sour cream mixture. You could let it sit in your fridge for an hour but then I recommend to add the salt before serving otherwise the salad will get watery. Instead of green onions or chives you could also use a minced red onion. Radishes are known as secret weapons against fungi and bacteria. The little sisters of white daikon radishes contain highly efficient mustard oils and many vitamins. The maximum of nutrients you will reap from veggies, that grow outdoors – under real sunlight. In doubt, I’d always recommend choosing organic produce mostly free from harmful chemicals. Eating pungent radish and drinking hot tea, let the starved doctors beg on their knees. What health benefits can you expect? Mustard Oils: These highly efficient plant compounds are responsible for the peppery taste of all radish types. As mentioned, they have an anti-fungi and anti-bacterial effect, especially in your stomach and colon. Just know that when you eat them you directly protect your digestive system. Studies also indicate that mustard oils might combat cancer cells. Smaller bulbs are more pungent than larger ones and contain also proportional more from the highly efficient oils. Selenium: The trace element is known as one of the most important anti-oxidant agents and anti-aging aid. Selenium is also discussed as a protecting factor in the context of cancer. Iron: This is another trace element that is important for blood building and energy supply of the cells. An iron deficit can lead among others to hair loss, lack of energy and depressive episodes. If you are in your forties and have one of the described symptoms I’d highly recommend to let the doctor check also your iron level (especially ferritin). Vitamin C: As a rule of the thumb – the “redder” or “pinker” the vegetable the higher its vitamin C content. 100 grams of radish contain 50 milligrams vitamin C. This bio compound also known as ascorbic acid is important for your immune system and protects your cells against harmful factors. Folic Acid: This B vitamin is important for blood building and proper functioning of mucous membranes. Folic acid is also indispensable for women who plan to become pregnant. A folic acid deficit can be harmful to the baby. Phosphor: This vital mineral is together with calcium responsible for strong bones and essential for an ongoing formation of cell membranes. 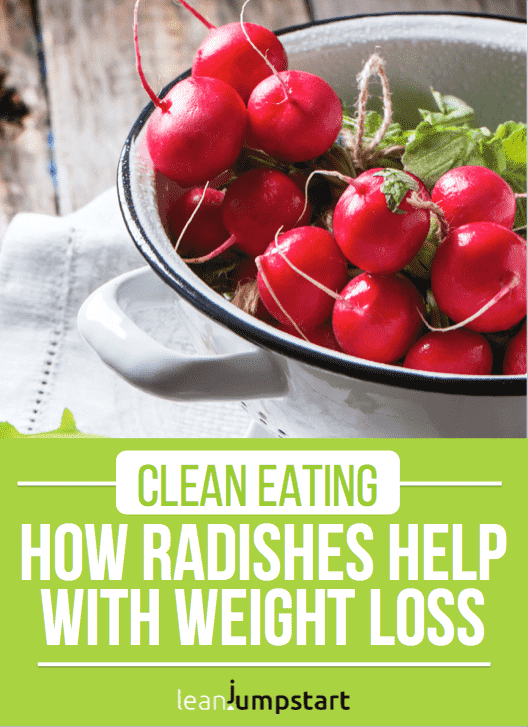 Ok, most vegetables come with certain weight loss properties and with just 14 calories per 100 grams radishes are also great for weight management. But this power food can more…The mustard oils have fat binding properties. This means that fat leaves unutilized your body – this works similar to the promise of some weight loss pills – but hey, with these pink bulbs it all comes in a natural way! What is more, the etheric oils stimulate the gall and support liver’s detoxification job. It was also found that radishes decrease the cholesterol levels in the blood. On top of that, the little bulbs can work as a diuretic and reduce blood pressure. 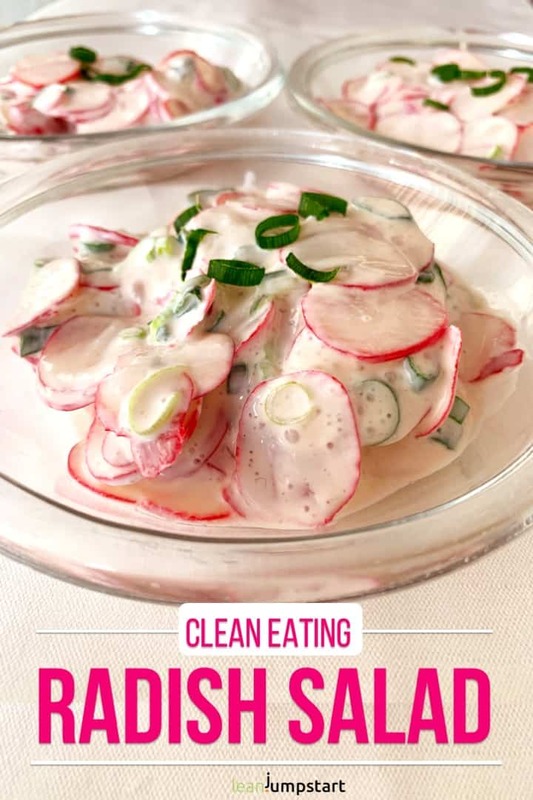 If you are still reading I have maybe convinced you to increase your radish nutrition by trying out this delicious salad recipe. For best storage, I recommend to remove and store the roots and leaves separately. The bulbs will keep wrapped in your refrigerator crisp box for up to five days. ‘Want to increase your vegetable intake for weight management? Then I warmly recommend checking my 52 Chef Habits E-courses with a strong focus on yummy, vegetable-loaded dishes that are quick and easy.